Al Balad restaurant is one of the best restaurants I have ever been to. It has a very special design, extremely delicious food, lovely staff and quick service. On top of that; it is a restaurant that only serves fresh food and they care about hygiene enough which is something very important. I have been there several times and I liked it. The menu is very diverse and the service is great. 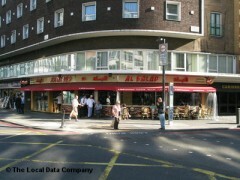 I have been to albalad restaurant with group of friends for dinner. The waiter offered us set menus for all of us which was cold mezze( homus ,moutabal,fattoush,tabouli and vine leaves) hot mezze(falafel ,kebbeih ,chicken liver,chese and meat sambousek)main course (mixed shawarma ,mix grills and many other dishes,the prices was afforded and the food was amazing and really tasty .the service was as five star .i really recomand this restaurant . better customer service please - the waiting staff are not on the ball with what they do. no eye contact when our order was taken thus our order was incomplete and when followed up the lame excuse we were given was there was a problem with the grill or charcoal. we ended up cancelling our order and yet the bill did not reflect this. will not go back.